You may be forgiven for thinking boho is so 2004 or perhaps you’d say ‘Sienna, who?’, but thanks to the likes of Isabel Marant influencing the high street, that bohemian vibe is well and truly here this season and working its way into our summer staples. You can hold the tiered maxi skirts, skimpy vests and enormous shades à la über-stylist Rachel Zoe and her no.1 client back in the day, Nicole Richie, because this decade it’s all about washed denim, peasant blouses, soft lace crochet and embroidered accents for fresh summer style in shades of white, indigo and those pops of neon which scream 2014. To work this boho style (which, by the way, is pure and simple mum-friendly throw-it-on chic, where creasing looks like it’s meant to be!) 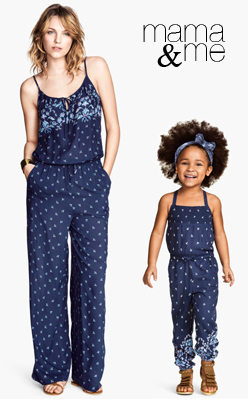 look no further than H&M, where you’ve probably seen they have this vibe down to a T, and not just for us, but for the little ones too. And if there’s one thing we here at CocoMama towers love, it’s mini-me styling! So here are my top picks from H&M’s current drop which are just perfect for reigniting your boho style, if that is, it ever went away. Co-ord mother-daughter outfits, of course, optional! The peasant blouse is great for hiding your mum-tum and flattering apple shapes. Opt for a longer short with turn-ups for a smarter (and more forgiving) alternative to the denim cut off. Switch from your skater shoes to espadrilles in high summer to avoid sweaty feet! If the bold, tropical floral trews of last summer seemed too much for your colour-shy self, these small print trousers in blue are an gentler switch from jeans to patterned bottoms. Match with mama in these blouses, perfect for holiday layering over a swimsuit by the pool. Short dungarees keep little girls’ style looking young and playful just as they should. Mini-me style is great but remember they’re still babies really! Neon espadrilles add to the fun edge and will really go with everything; treat them like a neutral. Colour-clashing is so much easier when you’re a child. These also come in highlighter pink if your little lady is as princess-obsessed as mine! Again, perfect for covering up but keeping cool in the sun, these printed trousers are also a fab alternative to the summer dress.